Storytelling has been around for centuries. From prehistoric cave paintings to 140-character tweets, it’s an art that has changed immensely. Thanks in part to technology, snail mail is a thing of the past, smartphones have become people’s personal diaries and long hand-written to-do lists are obsolete. Cashing in on this trend, Tellagami has created a mobile app that gives users an easy, creative way of storytelling. 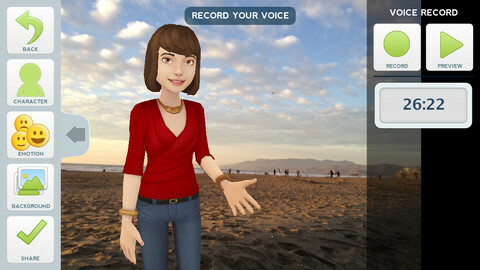 Users first select and customize a character using photos or their own voice, and then create a short story called a Gami to share with friends. It’s as easy as that! Even more, Tellagami has several features users can implement to customize their character. Users can mix and match with different pre-set backgrounds, resize their character to fit a specific background or even use a personal photograph. While on vacation at the beach, for example, send your friends and family back home a “Gami” about your trip with a personal photo as the background. Take your storytelling digital with text messages or record your voice for friends and family to hear. “Tellagami is inspiring creativity by allowing consumers and brands to put context and personality into a short video called a Gami that's easy to create and share in seconds on social media sites, on e-mail or as a text message,” said Sophia Kim, CEO at Tellagami. “The app is a self-publishing platform with a 3D graphical interface that allows you to customize a character and add your own voice and photos which makes every Gami unique. Gamis are being created to stay in touch with friends and family, share vacation photos, teach languages, add personality to blogs, send happy birthday wishes, promote new products and create a Web series. People are discovering new ways to use Tellagami every day." Tellagami is perfect for messaging, storytelling, marketing and education. Send your friends an invite-Gami through Twitter or Facebook or use the app as a travel journal or video diary. Tellagami has endless creative possibilities that take storytelling to the next tech-level. To download the Tellagami app and get in on the fun click here.